Hearts and Kotoko to present cup to JAK? Accra, Jan 13, GNA - Dr Nyaho Nyaho-Tamakloe, Chairman of the Ghana Football Association (GFA) has reacted to the looming controversy over the joint presentation of the CAF Confederation Cup trophy by Accra Hearts of Oak and Kumasi Asante Kotoko to the President. Speaking to the GNA Sports, the GFA Boss said the idea behind the two teams presenting the trophy was because of the historic significance behind the match since the two clubs are the first clubs from the same country to compete in the finals for a continental trophy. 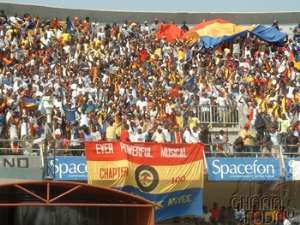 He said there is no hidden motive behind the idea, as the GFA only wanted to exhibit the same collective spirit that all those involved in the organization of the match from the security to the fans displayed the spirit of unity and should be continued as a collective effort to present the trophy to the President. The GFA Boss said that in any case the Kotoko players will just be there to greet the President as a Club from Ghana who participated in the finals but it is Hearts who will present the trophy they won to the President and not the two teams doing it jointly. "I will not have any inhibition in inviting Hearts to accompany Kotoko if the roles were reversed and Hearts were the losers and I do not understand why anybody wants to make a fuss out of this simple matter". He explained that the reason why the letter informing Hearts of the joint presentation was addressed to Kotoko and copied to Hearts was because the winning team will inevitably present the trophy to the President, hence it is Kotoko who needs an invitation. Dr Nyaho-Tamakloe said he has explained the significance why the two teams should jointly present the trophy to the President to Mr Ato Ahwoi, Board Chairman of Hearts. On the date for the presentation of the trophy to the President, Dr Nyaho-Tamakloe said his office had written to the President and there are expecting a response from the President's office before they relay the information to the clubs. Hearts last Sunday beat local rivals, Kumasi Asante Kotoko through penalty shootouts to win the maiden CAF Confederation Cup finals at the Kumasi Sports Stadium after the encounter ended 1-1 with the same result being recorded in the first leg played at the Ohene Djan Sports stadium in Accra.